Blog Archives - Side-Pro, Inc.
Lumber makes up over 40% of all building materials used, and cedar is the number one kind of wood siding chosen. When you’re deciding on the best siding material for your home, cedar offers distinct advantages over other materials. Because of this, doityourself.com offers three reasons to consider choosing cedar. Cedar is much more resistant to splitting, rot, swelling, bending, and mildew issues than other woods. This type of siding also requires less maintenance, unlike other kinds of wood sidings. It’s much longer-lasting than woods such as pine as well. A layer of finish is recommended to protect your cedar siding and keep it looking its best, and it should be refinished or repainted every four to five years for the best appearance. Regular inspections for moisture build-up and termites are suggested, along with twice-yearly cleanings. When properly cared for, cedar siding can last up to 75 years. This gives siding companies like Side-Pro, who use the highest quality products, the confidence to cover their materials and labor on any product defect with warranties of up to 50 years. Surprisingly, cedar is an environmentally-conscious siding choice since it doesn’t require a great deal of treatment or processing. In addition, it’s a renewable product that’s entirely biodegradable once its purpose has been served. Choosing cedar for roof or siding replacement can also save you substantial amounts of energy during the year because it has excellent insulation properties. The majority of homeowners choose cedar siding because of its beauty and its ability to blend in well with a home’s background. For individuals who love the look of natural cedar, simply apply a protective clear finish. Cedar can also be painted if you so desire, and you can select from tongue and groove, bevel, and rough cut patterns as well. White and red cedar is available, and the distinctive grain pattern of this wood greatly increases its aesthetic appeal. Siding companies like Side-Pro can replace or install your home’s siding or roofing with a variety of materials, and choosing the one that best meets your needs is an important decision. Cedar siding offers several advantages such as durability, environmental impact, and visual appeal. For these reasons, it’s a siding material well worth considering. Your roofing and siding can make or break your home’s protection from the elements as well as raise or lower its curb appeal. It can affect your home’s value, and insulates your home from the weather, and your bank account from high surprise energy bills. If you have noticed any rot, warping or cracking in your roof or siding, or your utility bills rising, it may be time to consider repairing or replacing your roofing or siding. When undertaking such a significant project, there are many factors to keep in mind. Print out or jot down the list of basics below to have handy when you visit your siding and roofing company to discuss siding or roofing installation. While vinyl siding has had a popular run, cedar siding is considered by many to be a superior option. There are 15 different types of siding. Lumber constitutes more than 40% of building materials. Cedar siding can last up to 25 years with proper maintenance. To maintain your cedar siding, it’s recommended to apply a new coat of paint, sealer, or stain every three to seven years. If your cedar siding is painted or stained, it’s recommended to repaint or re-stain the siding every 10 to 15 years. Hardie Plank siding is the most favored type of siding in America and is installed on millions of U.S. homes. Owing to its strength, beauty, and durability, Hardie Plank siding enhances the aesthetics and protection of homes in all manner of climates. Available in myriad looks and textures, all of which include PrimePlus sealer and primer, it provides an excellent painting surface and it creates an environment hostile to fungus and mildew. For your peace of mind, Hardie Plank offers a thirty-year limited warranty. Bevel cedar siding is another option that provides both durability and beauty. It is crafted by sawing lumber at an angle to produce two pieces that are thicker on one edge than the other. The result is siding with one textured side and one smooth side. When installed horizontally, it creates a handsome shadow line. When considering roofing installation and contractors, be sure to look for longevity, experience, and plenty of great customer reviews! Many people all over the United States are looking to change the siding on their homes. Cedar, vinyl, and fiber cement are currently the three most popular choices for home siding materials. If you are talking to siding companies about redoing the siding on your home, you may not know which to choose, but it is important to get the right siding and siding insulation for your house and climate. Most siding insulation is able to handle winds with speeds that reach 100 miles per hour. Before you talk to any siding replacement companies, you should take some time to select the right siding for your home. Start by getting to know your options. Before you start dealing with any siding installation companies, you should know more about each of the options you have available to you. There are a number of options beyond the most popular three, including brick, plastic, stone, stucco, and aluminum. You need to think about the way the siding looks and how well it performs. Cost is also a factor that should be considered. For example, vinyl lasts a long time, is generally reliable, and can be cost-effective, but many homeowners do not like its artificial look. Cedar siding looks great but does need more care. Stone and brick cost a lot but they look great and can last a long time. Knowing what you want from your siding can make a big difference in which material you select. Research different looks and designs for your siding. When people visit your home, the first thing they see is the exterior. Before you start working with any of the siding companies in your area, it helps to know what kind of look you want for your home. The right siding design can do a lot to boost the curb appeal of your house. You should go with a color, style, and material that fits with the look of your property. You should also look at ways to make your home mesh with the others in your area. Take the climate in your area into consideration. When you talk to siding companies, you need to think about the weather your area experiences. You need different siding if you live in a region of the country that sees a lot of snow, hurricanes, blizzards, extreme heat or cold, extreme humidity or dry conditions, and the amount of sun your home gets. These weather conditions should be considered when you are looking at the different siding options you have available to you. Talk to at least two designers. When people are looking at hiring siding contractors to put in new siding, they often consult with home designers to get the right materials and styles for the siding. You can also talk to your friends, family, and neighbors to get their opinion. If different designers or people in your life come back with the same opinion, you know you are headed in the right direction. Hire the right siding installers to do the job. Anytime you hire someone to work on and around your home, you have to take care to get the right company. There are a lot of siding companies out there, so you should be able to get the right one to do the job on your home. They need to have the right license and insurance and come with good references. Make sure they only work with high-quality materials. Going with a company that has a track record in your area can be helpful in this area. It is never a good idea to go with a contracting company that arrives on your doorstep offering a special deal that is time sensitive. Getting the right siding for your home takes time and effort. You need to work with are siding companies to get the right style and material. This is a big deal for the look of your home, and your siding also protects you and your family from the elements. Siding is one of the central components of a home’s appearance. Aside from the windows, front door, and roof, it’s your home’s first impression on everyone who walks in. That’s why so many homeowners choose cedar siding. Not only is this type of siding beautiful, but it’s also sturdy and you can style it any way you like to fit your home. But how do you know when there’s an issue with your cedar siding? Your siding installation may have gone off without a hitch thanks to your experienced siding contractors, but it’s on you to make sure your siding remains as good as new. Not sure where to begin? Here are a few essential signs of damage you need to be on the lookout for. Since cedar siding is a type of wooden siding, it’s important to perform regular maintenance checks for warping and rotting. Warping and rotting are especially common if you live in a wet, multi-seasonal area. 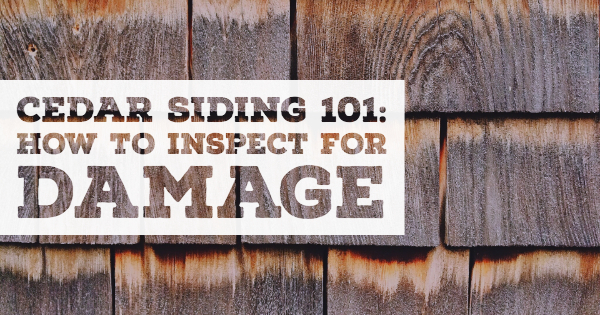 Even more so, these issues are common in cedar siding that isn’t well-maintained. When your siding installers tell you to apply a new coat of stain or paint every three to seven years, this is why. Make sure you listen! If you do notice any warping or rotting, make sure you call for siding replacement or repair immediately. Like any other type of siding, cedar is susceptible to attacks by pests. Woodpeckers, termites, and carpenter bees are all critters you should be on the lookout for, as they can cause some pretty serious damage if left unchecked. If woodpeckers are your primary concern, consider installing accessories like windchimes around your home, which may help keep them at bay. Cracks are the gateway for warping and rotting. That means as soon as you notice a crack, no matter how small it is, you need to seal it up immediately. There’s nothing wrong with a temporary DIY patch, but it’s always best to call your siding company. This is an especially good idea if your cedar siding is getting up there in age and may need to be replaced in the near future. There you have it! If you’re vigilant about your maintenance and keeping an eye out for these telltale issues after your siding installation, it should last you for many years to come. Winter is nearly over, which means it’s time to start fixing the maintenance problems the wind and snow have made for you. The good news is, once you get these early springtime chores in the bag your home will be all set for the season. With that in mind, here are some major maintenance tips to help you on your way to getting your home ready for warmer weather. The most common housing problems you’ll experience after winter are roofing and siding problems. That’s because your roof and siding is what’s protecting the inside of your home from the chilly weather. Have a professional take a look at your shingles and siding to determine if there are any repairs that need to be made or water damage that needs to be fixed. You might be able to spot these issues yourself, but a professional has a trained eye to spot smaller problems. Spring is known for its showers, which means you need to make sure your gutters are clear. A damaged gutter system can cough water back up onto your roof. The resulting water damage won’t be pretty. Clear out any leaves and debris that might have made their way into your gutters during the winter season. You can also contact a professional if you don’t feel safe doing this project yourself. Either way, make sure your gutters are in great shape. If your home has a crawl space, that means you have vents along your foundation walls to provide air circulation. This helps to prevent excess moisture from settling and growing mold. During the winter months, the screens in your foundation vents will collect leaves and debris. Clean out these vents by hand or use a vacuum and repair any small holes you see to keep pests away. Where can I find cedar siding contractors near me? Cedar siding is the number one most popular type of wood siding and can last up to 25 years with proper maintenance. That said, if you’re looking to make a siding switch away from vinyl, cedar siding is the material for you. Side Pro offers high-quality cedar siding to have your home looking its best year-round. To learn more about our siding installations or siding replacements, contact the cedar siding contractors at Side Pro today. It’s true that the aesthetic of your home’s siding ought to be something to consider when you’re having new siding installed. But it’s good to remember that siding isn’t just there to make your house look pretty. It’s also there to provide insulation. You need to protect your home from the outside first. So it’s crucial to take the climate of your town into consideration when you’re replacing your siding. How does climate impact my siding choices? The elements can impact the materials your siding is made of in different ways. Storms can bring strong winds, so if your area is prone to wind gusts it would make sense to have siding panels that won’t fall off in the blink of an eye. Fortunately, Seattle isn’t known for its harsh winters so you don’t need to worry as much about winter storms tearing your siding at the seams. Something you do need to consider though is the humidity. Seattle is known for its oceanic climate. Summers are hot and dry, winters are temperate and wet. You need a siding that’s water-resistant. What siding is great for wet climates? You might think that wood siding is the last thing you want in a wet climate. But that’s not actually true. In fact, certain types of cedar siding are exactly what you want in an oceanic climate like Seattle. Red cedar siding, in particular, is naturally water-resistant. This is because of its oils and tannins, which help to keep moisture at bay. These oils have other benefits too. They give your home a wonderful smell while also making it unappealing to insects, fungus, and decay. Just be sure that you give your cedar siding the proper maintenance it needs. Surface treatments every three years help to protect your siding from moisture, which protects you and your family from insulation problems and mold issues. Where can I find siding contractors near me? Lumber makes up 40% of all building materials, so it’s important that the lumber you choose for your home’s siding installation is high-quality and from a reputable source. Side Pro has the high-quality cedar siding replacement you need to keep your home insulated and looking great. To learn more about our siding installation process, contact our siding contractors at Side Pro today. It’s easy to take your home’s siding for granted. It’s on the house, protects the house, and is just there — until there starts to be issues with how well your siding is holding up. If you live in regions where you get inclement or rough weather frequently, your house will probably take quite a beating, thanks to the wind, rain, snow, and other debris flung at your house as a result of the elements. At some point, you may need to get siding contractors in to help get your siding looking ship-shape again. Before you call siding contractors though, you’ll want to have an idea about what kind of siding you want to replace your existing siding with and what to look for in siding companies and contractors to begin with. And, of course, you should know the warning signs that it’s about time to call in a siding company for siding replacement. One of the first things you should know is that siding is measured in squares of 100 square feet (10 x 10 feet increments). There are fifteen different kinds of siding but the most popular types of are cedar, vinyl, and fiber cement, and a high percentage of homeowners have siding made from one of these varieties. Cedar is the most popular of these three types and can last up to 25 years with the right maintenance. “Proper maintenance” means that a new coat of paint, sealer, or stain should be applied on your siding every three to seven years, so it’s definitely not a set-it-and-forget-it type of siding. Vinyl, on the other hand, is extremely low maintenance. Good quality vinyl siding doesn’t need to be painted or caulked and cleaning is easy — all you need is mild soap and a garden hose. How Do I Know When I Need My Siding Replaced? Most of these cues are visual. It might start looking shoddy from the outside — cracks or gaps are evident in the siding or it’s starting to crumble and peel away. You might also consider changing to a different kind of siding (one that’s more low maintenance than your current choice) if you find yourself lacking the time and energy to conduct proper maintenance. Lack of maintenance will lead to your siding’s disrepair, so if it’s time for new siding installation, you might consider switching your type of siding entirely. Another tell-tale sign that it might be time to call in the siding contractors is if you see a substantial increase in your energy bills. Faulty siding is more likely to let drafts in and so you’ll expend more energy heating and cooling your home, raising your bills. And of course, if you see signs of rot or mold, it’s time to start looking for siding companies to come evaluate and make a plan for replacement. Keep in mind too, that replacing insulation when you replace siding is also a smart move. What Should I Look For In a Siding Company? Shop local. Find a siding company in your area who’s been around for awhile, has a good reputation, and who can direct you to other locals who they’ve completed jobs for successfully. You should always ask about what kind of warranties or guarantees they offer and what happens if siding needs repair after the initial installation. Make sure they have the right insurance, licenses, and certifications as well. Siding contractors should also be knowledgeable about the different kinds of siding, how they’re installed, and be able to offer you advice on what they think might be the best for your home, depending on your needs, the home’s appearance, and the area you live in. And of course, you’ll want to know how payment works — what the schedule is like, what you’ll be paying for, and so forth. Don’t let your siding slip too far into disrepair. It’s an important part of your home’s overall health and can wind up saving you money in the long run. Plus, new siding can have a positive effect on home resale value, if you’re considering that down the line. Which Option Is Better: Cedar Siding Or Vinyl? Owning your own home is great, but there are many things to consider when renovating or redesigning your home. Siding is a great way to change the look of your home and improve curbside appeal. Luckily, there are many different siding options available to choose from. The two most popular options of siding are cedar and vinyl. So, which siding is best for your home and what is the difference between the two? Cedar siding is a natural insect repellent, making it a great option if you live in an insect-infested area. Keeping bugs out of your home is a necessity when it comes to living comfortably. If your home can naturally deter them, that’s a bonus. Cedar siding has various styles and designs depending on your budget. Cedar siding is also a great insulator which is great for keeping your heating costs down. Of course, you will want to have proper insulation throughout your home no matter what, but cedar has an extra insulation aspect that synthetic vinyl does not. Cedar siding is a great noise barrier as well. It blocks out much more sound than your average synthetic siding does. When deciding on new siding, cedar is a great option if you can afford it. Don’t forget you have to factor in the cost of installation, water repellent and primer, and decide on a stain or paint. If you do decide to paint your cedar siding it is best if you repaint it every ten to fifteen years to keep your house looking great. Synthetic vinyl siding is a great option for those on a budget. They have hundreds of colors and designs available, leaving you with a million different options to customize your home. Vinyl siding is a very popular option as it requires a lot less time to install and doesn’t require any type of paint, primer, or water repellents. Vinyl siding lasts for years but can end up fading due to sun exposure. When deciding on new siding it is best to pick a color that you will love for years because it is not a simple paint-over process for a color change. You will need to reside your entire home to change the color of it. The bonus to having vinyl siding is if you ever need to replace a section due to weather damage or wear and tear, it simply pops out for easy replacement. Vinyl is simple to care for since all you really need to do is clean it occasionally with a hose. Choosing the right siding options really depends on what you’re able to afford and what you want out of your purchase. By buying cedar siding, you can change the look of your home anytime you like with a bucket of exterior paint. When residing your home with vinyl, you will have to do the whole home all at once. Both have a long life expectancy and are easy to care for. In the end, it comes down to what you prefer.